The HT34-496 is not available for new applications. Please consider the HT34-696 as a replacement. 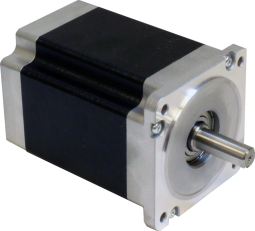 To view all step motors go to the browse stepper motors page. For additional assistance selecting a step motor contact us or call 1-800-525-1609. The HT34-496 two-phase stepper motor is designed for use with the STAC5 and STAC6 series of stepper drives and is suitable for a wide range of motion control applications. The motor is optimized for use with high bus-voltage drives and comes with an integral 10 ft shielded cable.